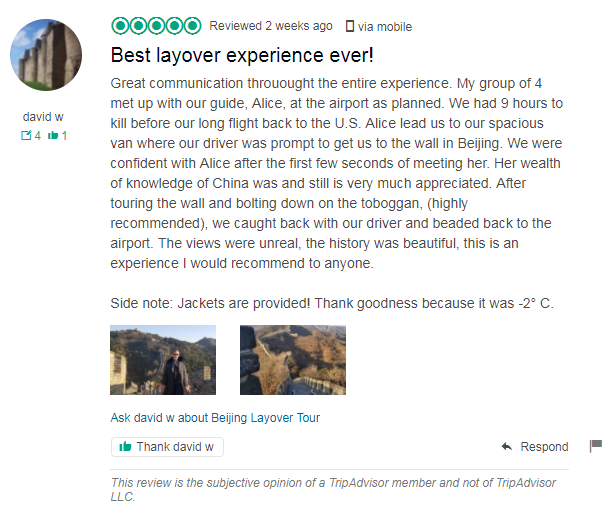 Tour Description: Upon arrival at Beijing airport, our private tour guide will pick you up, holding a sign with your name on for you to recognize. We will then drive to Juyongguan Great Wall (1 hour), the nearest section of the Great Wall to Beijing. Stay at the wall as long as you can, and then return airport. According to your layover time, we do not think you will have enough time to visit the Great Wall. Sorry about that! Hi! So we have a 7 hours layover, and were wondering if this private tour would be possible. We arrive at the airport at 4:40am, and I read it takes about an hour to get out of the airport. Would you be able to pick us up at 6am? And then we would be at the wall at 7am, which is when it opens? Our flight leaves at 11:35am, so I think we’d have to be back at airport around 9:30-10am. Please share your advice, we know it may be tight but want to know if it is possible. 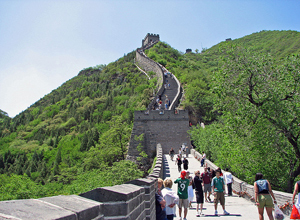 Also, another question – what is the difference between visiting the wall at Juyongguan and Mutianyu? Which is better? Thanks for your help!! Your layover time is too short. 1 hour is not enough to get out of airport, because the airport changed the visa-free procedure. You will take 1.5-2 hours to apply the visa free and find our guide. And you would have to back to airport at 9:30am to catch your next flight. If the traffic is not good, you will miss your flight. So we do not recommend you to do a tour. Sorry about that! Hello! We arrive at the airport at 11:45am and depart at 9:00pm. Given that we need to allot sufficient time to check back into the airport, what are the best tour durations for us to tour the Great Wall? According to your layover time, you will have plenty of time to visit the Great Wall. We just sent you an email about detailed tour itinerary, please check. Thank you! We have a 12ish hour layover in China with some odd times. We get in about 1am, then leave around 1:45pm the next day. What would be the best case scenario to see the great wall?? And we have sent you an email about the tour details, please check. My family (3 adults, 3 children) look to have a 7.5 hour layover flying in at 5:20 AM departing 12:50 PM on April 19. Would we have time to visit the Juyongguan Great Wall? Your time is a bit tight. According to our recent experience, you may need to spend more than two hours to get the visa-free stamp and get out of airport. So we do not recommend you book any tour. Sorry about that! Hi there! My husband and I will be in Beijing on December 23rd. Flight lands at 6:30am and our next flight back to the US leaves at 12:45pm. Any chance we can do a tour? Would LOVE to see the Great Wall, but am also interested in other city tours….that our timeframe allows! Please let me know if any are possible. Thanks so much! Since the airport have changed the get through process. There are two queues you have to wait, you first go to the first queue for a visa free stamp then go to the second queue for immigration permit. It will take longer time than before. So we do not think you will have enough time do the tour. Unless, you can change your flight CA980 to be CA960. I am Travelling from Singapore to Daqing (china) with an layover between 6am to 1pm. I am interested to visit either Juyongguan or Badaling. May I know is the tour doable and if our flight got delayed, can we get any refund? You will have time to visit Juyongguan Great Wall. We just sent you an email, please check. If your flight got delayed, please do inform us in advance. Then we will cancel your tour and refund you in full.